MSI provides for a wind of change with its 15.4 inch GT640 and integrates Intel's Core i7 and Nvidia's GeForce GTS 250M into their own gaming range. If the components are able to take a lead on the forerunners, like the GX623, the GT628 or the GT725, in terms of performance will be clarified in our comprehensive review. Whilst MSI has only altered details in the design lately, the manufacturer proves to be far more experiment-eager with the components. A real value for money sensation is still the 15.4 inch and 800 to 1000 euro expensive GX623. 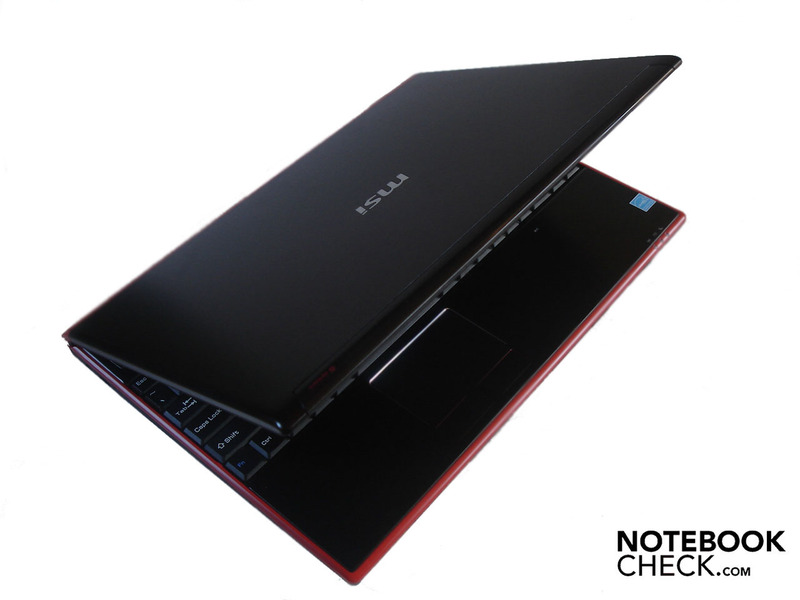 The notebook bids an unusual amount of performance at an affordable price due to Radeon HD 4670. Intel's Core 2 Duo is relied on as the processor. The bandwidth ranges from the T6500 with 2.10 GHz and the T6600 with 2.20 GHz (each with 800 MHz FSB, 2 MByte L2 cache), over the P7350 with 2.00 GHz (1066 MHz FSB, 3 MByte L2 cache) up to a P8700 with 2.53 GHz (1066 MHz, 3 MByte L2 cache). 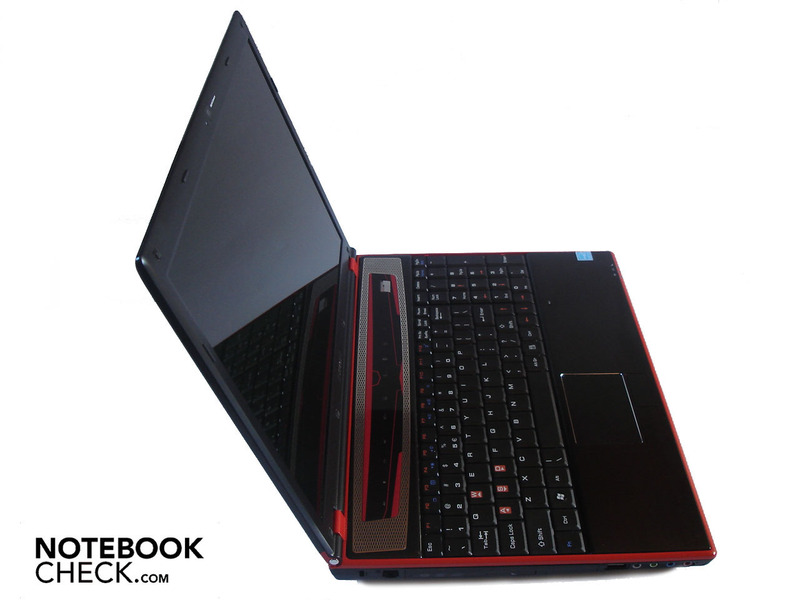 The 15.4 inch GT628 is active in the next price league (1100 to 1300 euro). 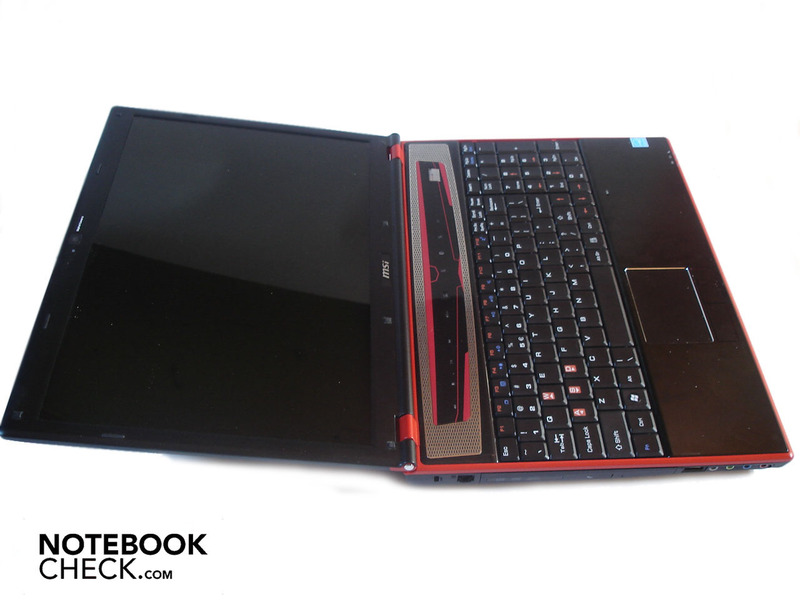 You can choose either the Core 2 Duo P8700 or the Core 2 Quad Q9000 (2.00 GHz, 1066 MHz, 6 Mbyte L2 cache). The graphic card is from Nvidia and listens to the name "GeForce GTS 160M". 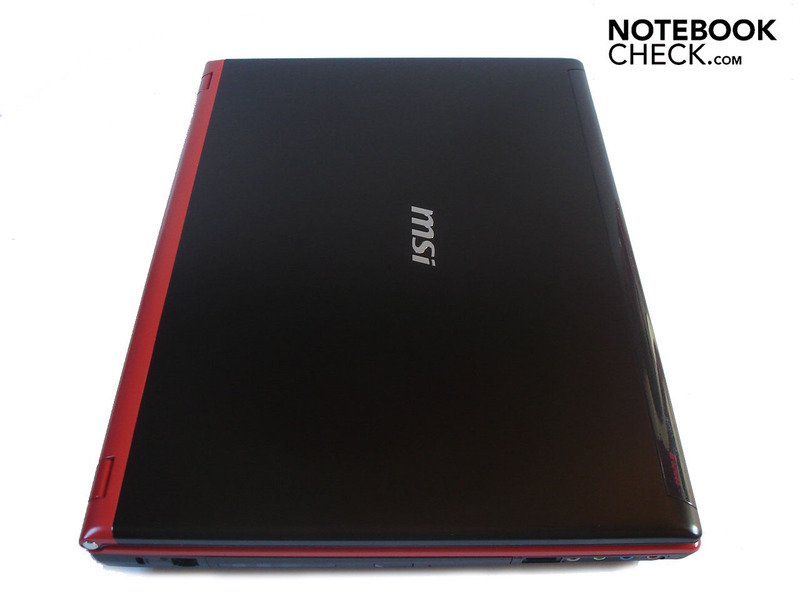 The meanwhile new 15.4 inch GT640 for around 1400 euro has been reviewed by us. 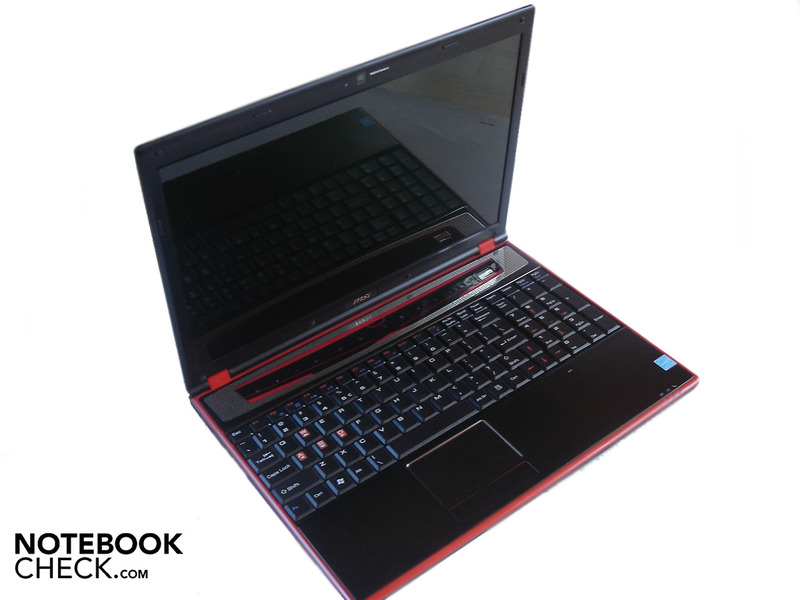 The notebook promises a very high performance equipped with Intel's very strong Core i7-720QM and the new GeForce GTS 250M. The current top model is finally the GT740 for merely 50 euro more. The components correlate to the GT640 for the largest part, but the display size is stretched to 17 inches. The previous 17 inch spearhead, GT725 with a Core 2 Duo P9500 (2.53 GHz, 1066 MHz FSB, 6 MByte L2 cache) or a Core 2 Quad Q9000 for about 1300 euro is scarcely available anymore. This is too bad in view of the integrated Radeon HD 4850 that belongs to the stronger mobile graphic cards and is only very rarely built in. 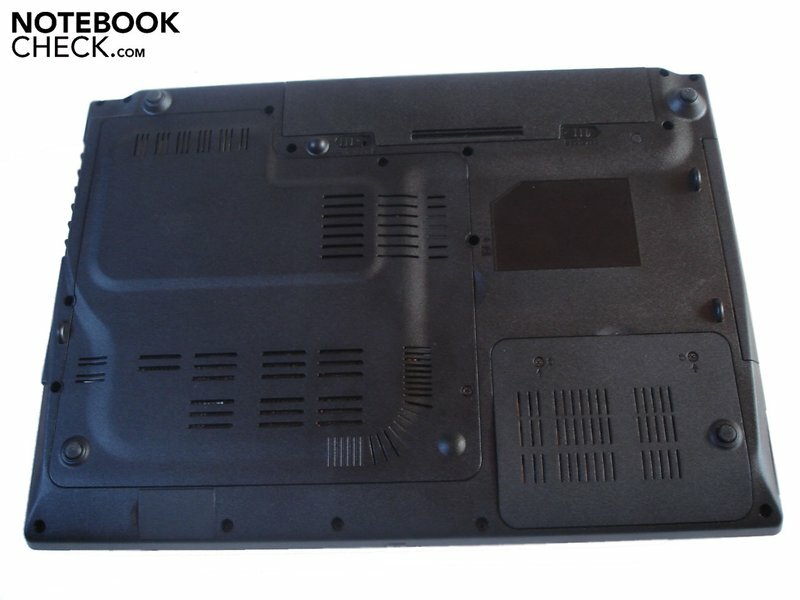 MSI mainly uses black, brushed aluminum in the GT640, which is why the case makes a very high-end impression in terms of material characteristics. Due to the aluminum, the case is also less susceptible for scratches than high-gloss plastic that is preferably used by other manufacturers. Above that, the matt surfaces prove to be more resistant against any kind of smudge, at least subjectively. There might be a horde of various fingerprints or streaks on the case after a while but they are only striking at a closer look. The GT640 has to put up with critique in terms to stability, despite the employment of aluminum. The case yields obviously at stronger, selective pressure on the bottom as well as the upper side, which often leads to a chintzy clattering. 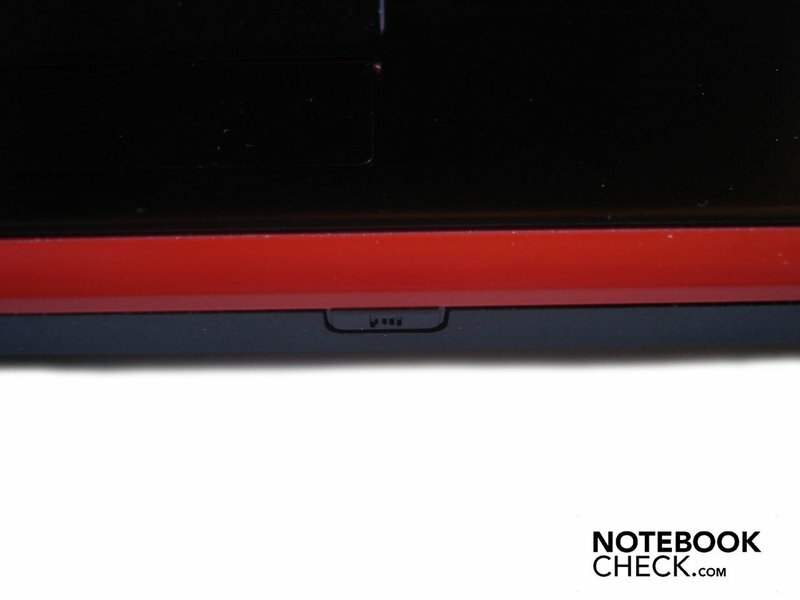 The notebook lid can be depressed quite a bit in the center and in the area between the hinges. Furthermore, a stronger grip on the display frame quickly leads to image distortions. 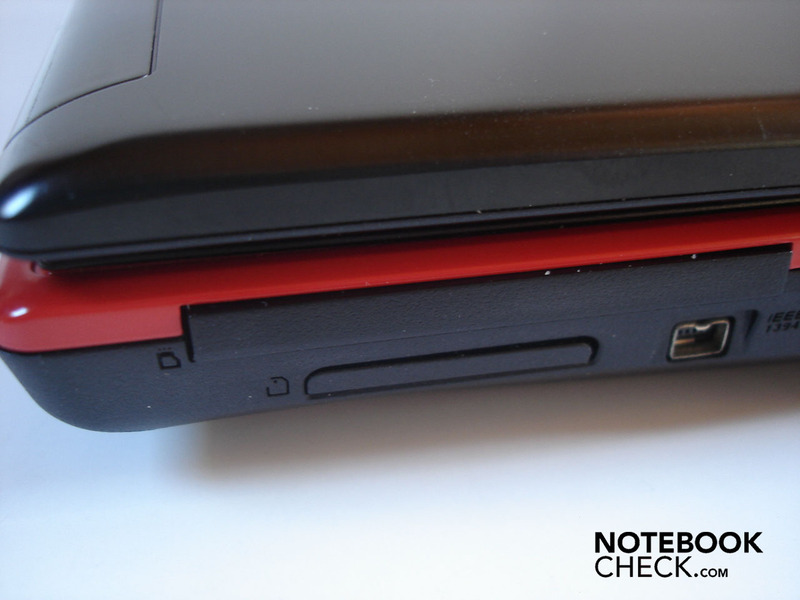 In return, the GT460's small hinges are surprisingly stable and keep the 15.4 inch display well in position. However, the pleasantly light case with a weight of 2720 grams lifts a bit at opening. Unusual: The display can be tilted to almost 180°; most notebooks are at their maximum at 140° at latest. The case makes a surprisingly compact impression with its moderate size of 360 mm x 260 mm (width x depth) and a fairly low height of 36 mm. 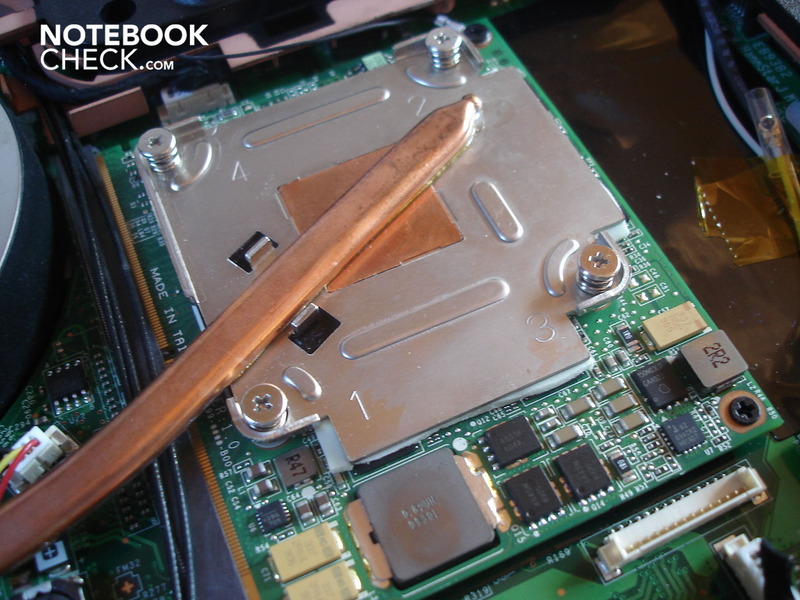 Even if the available area, of course, on a 15.4 inch notebook isn't exactly sized generously, MSI has equipped the GT640 with numerous connections. 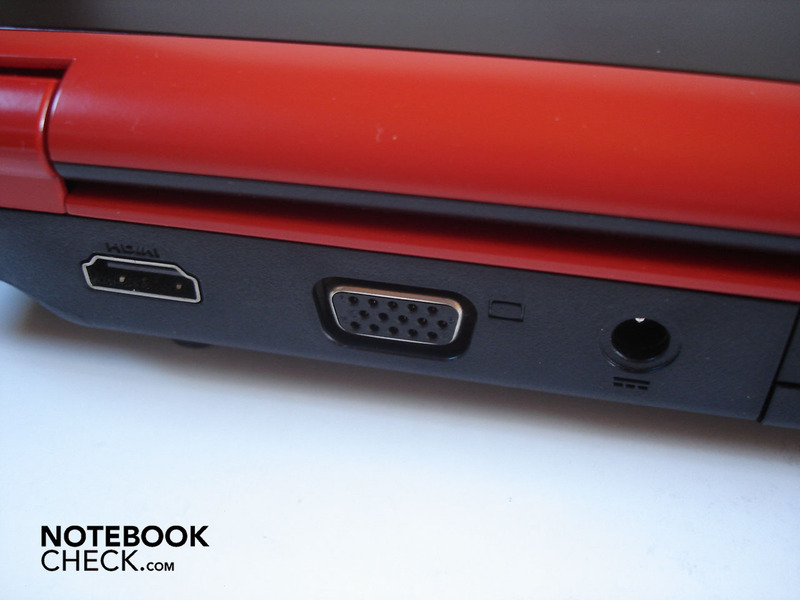 Two video-outs are already placed on the rear with HDMI and VGA. The DC-in and an antenna connection are also on the rear. 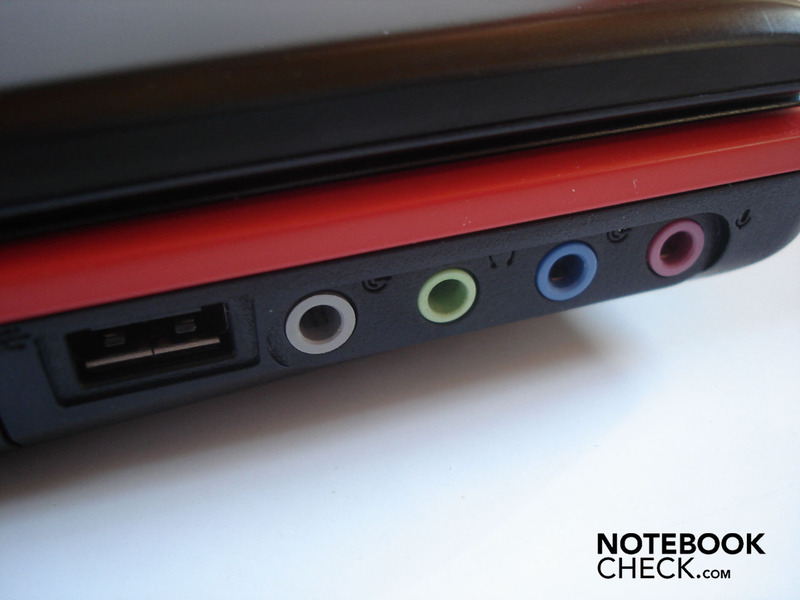 Following on the left with an RJ-11 modem port, a multinorm DVD burner, one USB 2.0 port and four audio sockets marked by colors (headphone, microphone, line-in, line-out). 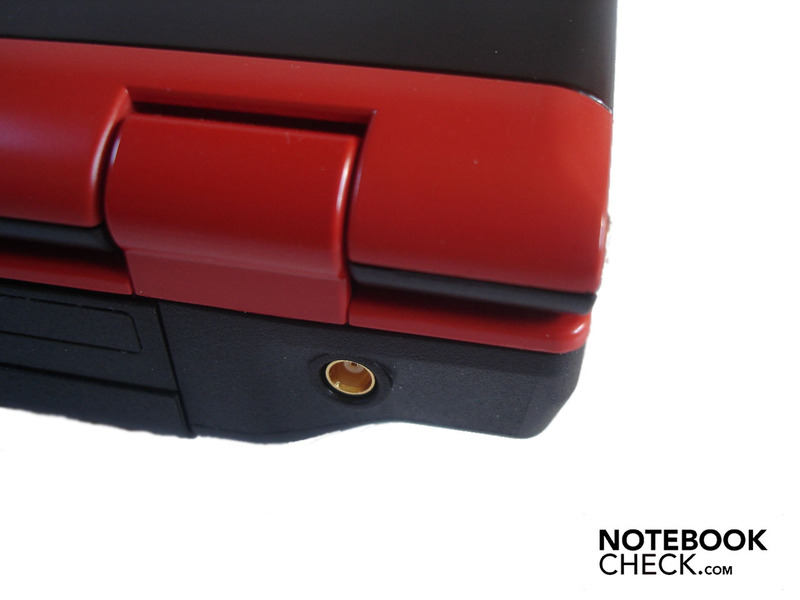 An almost invisible infrared receiver is hidden on the front. Furthermore, the right has an ExpressCard slot, a 4-in-1 cardreader (XD, MS, MMS, SD) and a Firewire port. 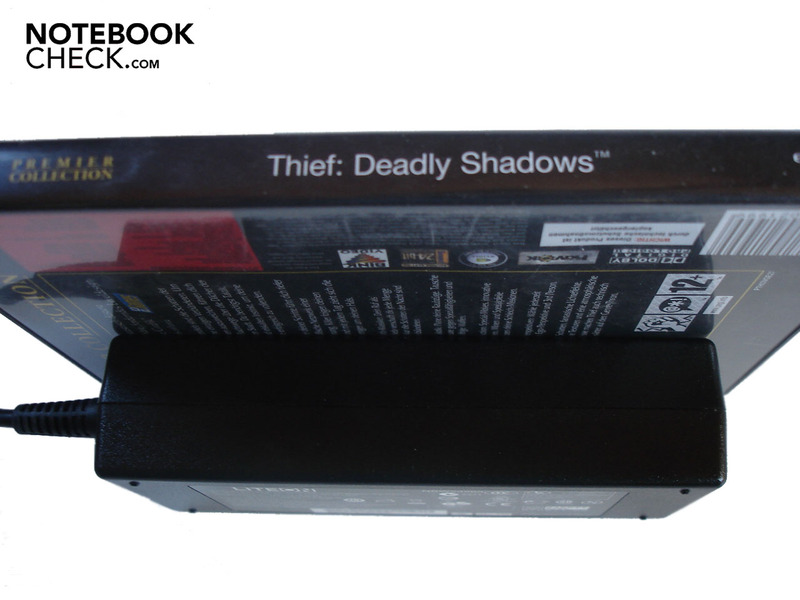 This array is concluded by an USB 2.0 port, an eSATA/USB 2.0 combo and a RJ-45 gigabit LAN. 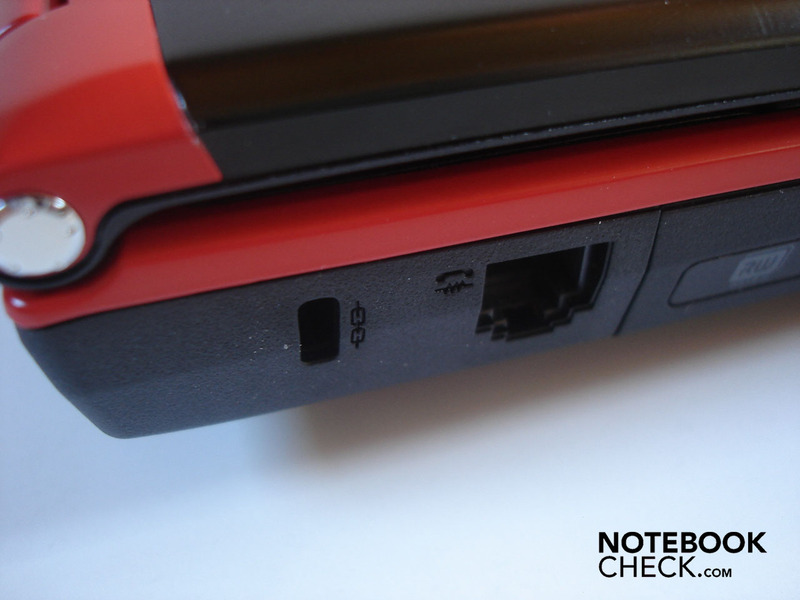 The package is rounded off with Bluetooth 2.0 and WLAN a/b/g/n on the wireless side. 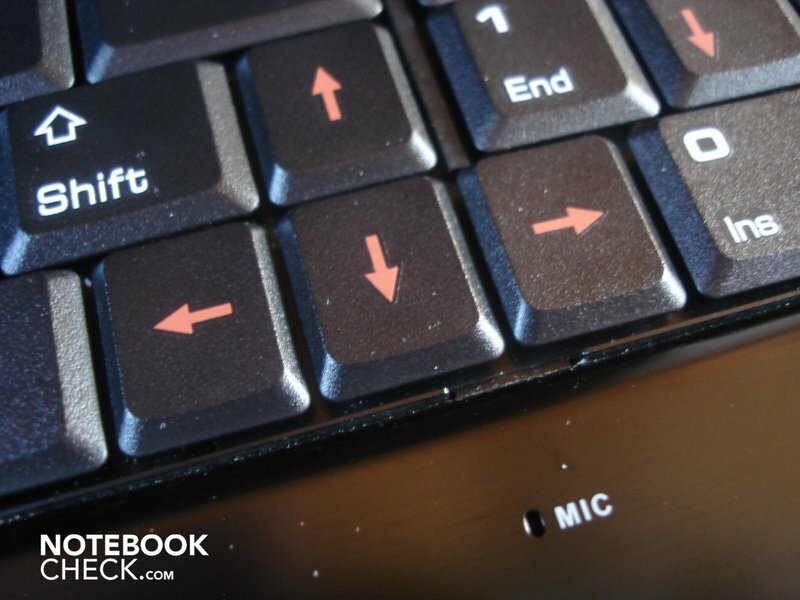 Otherwise, the GT640 also has a 2.0 megapixel webcam and integrated microphone that has been placed beneath the arrow keys. We found the port distribution on the rear good at most. 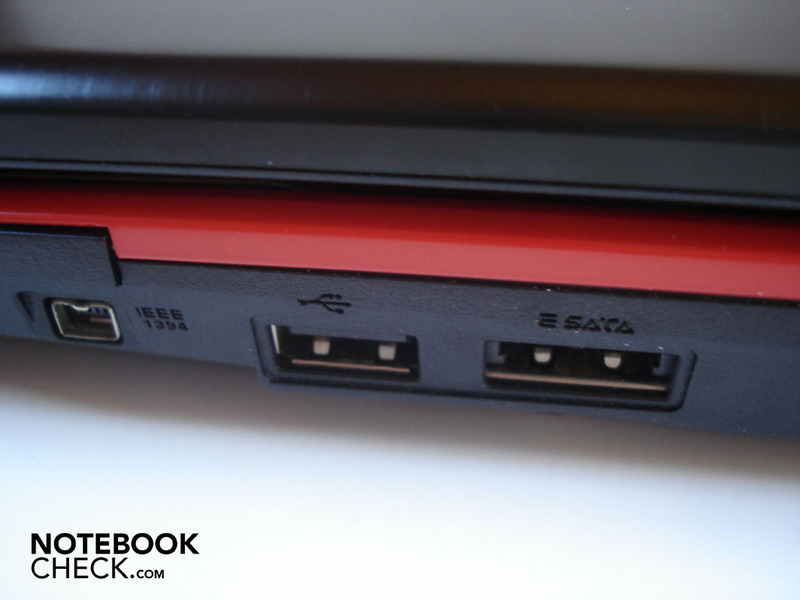 In our opinion, the USB port and audio sockets have been placed to far front on the left. 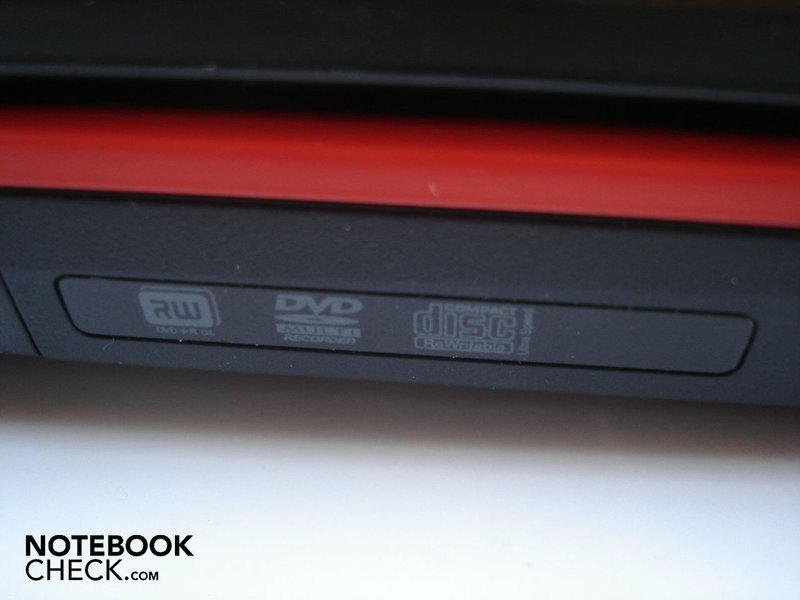 When the DVD burner is opened, it's likely to be obstructed by USB and/or audio cables. One single USB 2.0 port on the left is also a bit scanty. The right side is still okay in terms of distribution, even if the USB 2.0 connections are again placed a bit too far front and the RJ-45 gigabit LAN port would have been better placed on the rear, in our opinion. MSI has, commendably, restrained itself quite well in view of software installations and has wavered on unnecessary and resource devouring ballast. Thus, almost the complete performance, almost without any restrictions, is available in the state of delivery and the user isn't bothered with various never-ending deinstallations. 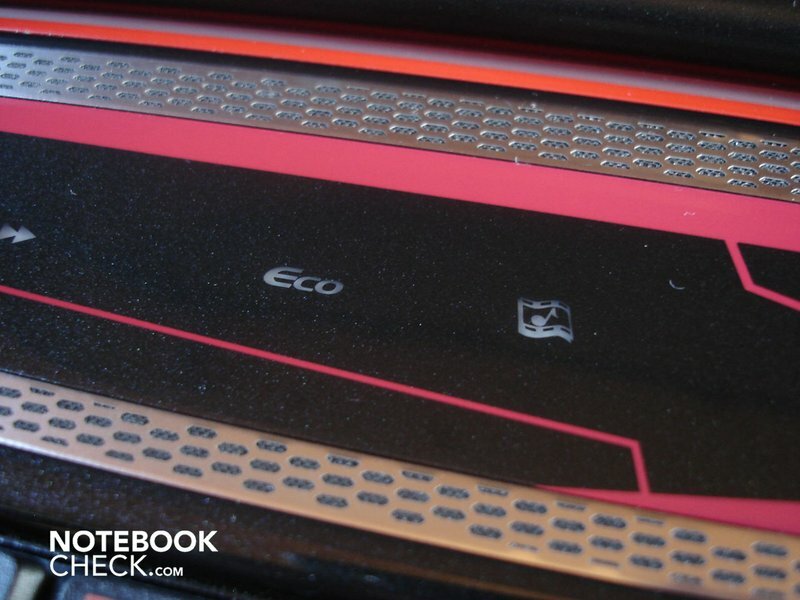 Representatives worth mentioning are especially the "Eco" and the "Cinema Pro" mode. The Eco function is an energy savings system that allows the user to choose various actions with a push of a button. Office, movie, presentation, gaming and "Turbo Battery" can be triggered with it. In return, the Cinema Pro Technology allegedly provides for a heightened movie enjoyment. Thus, a push of the button allegedly triggers a more detailed image quality, to an increased sonority and an amplified bass in this case. The so-called "SRS Premium Sound" is also enabled. If Cinema Pro had an impact in our sound check can be read later in "Emissions". 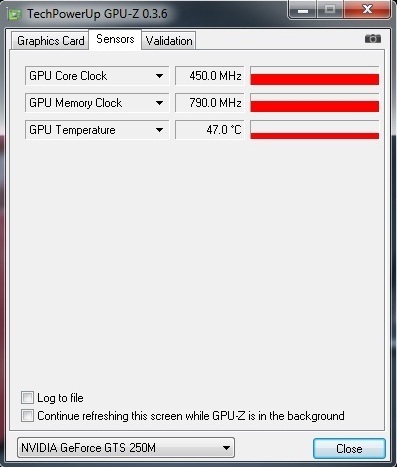 The user has to do without the turbo mode for overclocking the processor that MSI usually has. However, this isn't at all necessary because the integrated Core i7-720QM automatically overclocks itself. The keyboard's verdict can, unfortunately, be summarized in one word: Disaster. 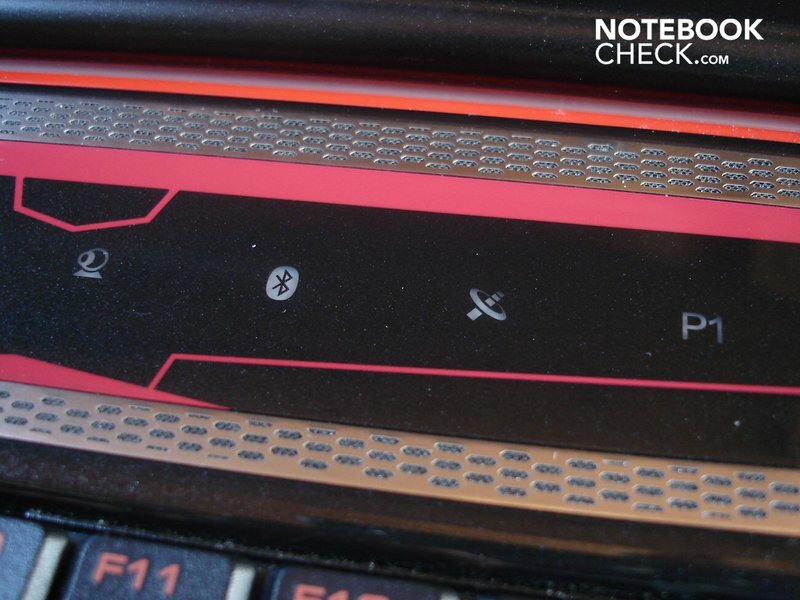 MSI obviously indifferently ignores the critique from its users and the press, as we can't otherwise explain the stagnation in terms of keyboard quality. The FN most definitely doesn't have its place beside the left Crtl key in our latitudes. Firstly, gamers are deprived of the comfort of one of the most important (Crtl) keys, and secondly you constantly hit the Fn key unintentionally at office use, too. Even the good old standard layout had to suffer because MSI blithely altered the position of the one or other key (e.g. # ' and <> |). A few keys have also turned out far too narrow. 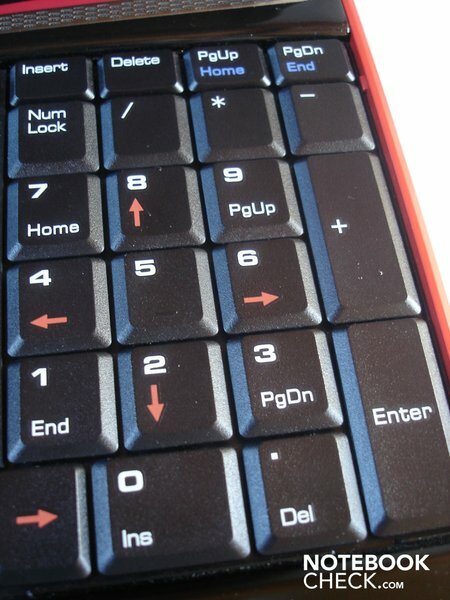 Among others shift, enter and backspace. Now we come to the keys' pressure point, which feels extremely indefinite and indistinct not last due to the fact that the keyboard partly yields obviously. Additionally, the keys clattered when they're triggered, which naturally enhances the low-end impression. 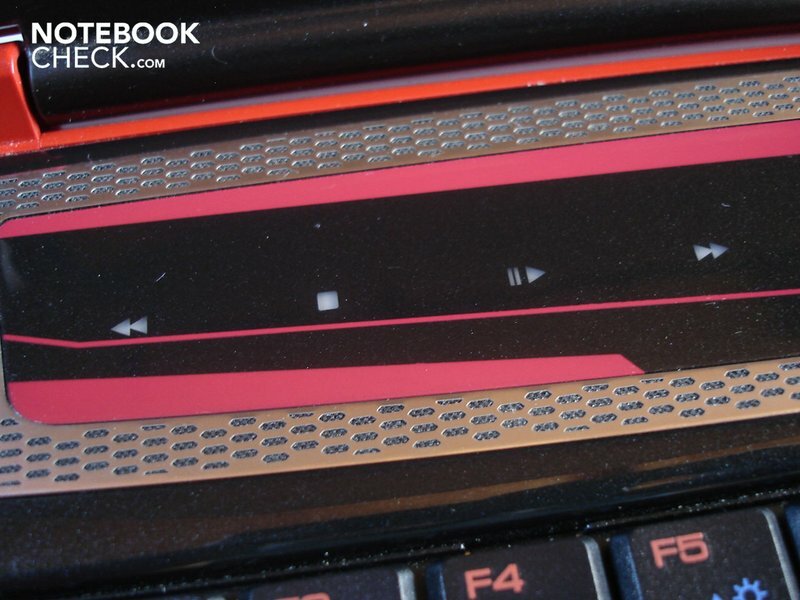 A further flaw: The keys stick sometimes and recoil spontaneously with a loud clacking noise. Summing up all of this, results in perpetual typos even after a longer accommodation period. 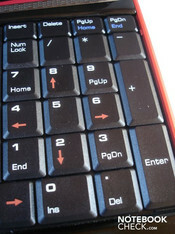 The only positive thing that we can report about the keyboard is the presence of a separate numerical block. 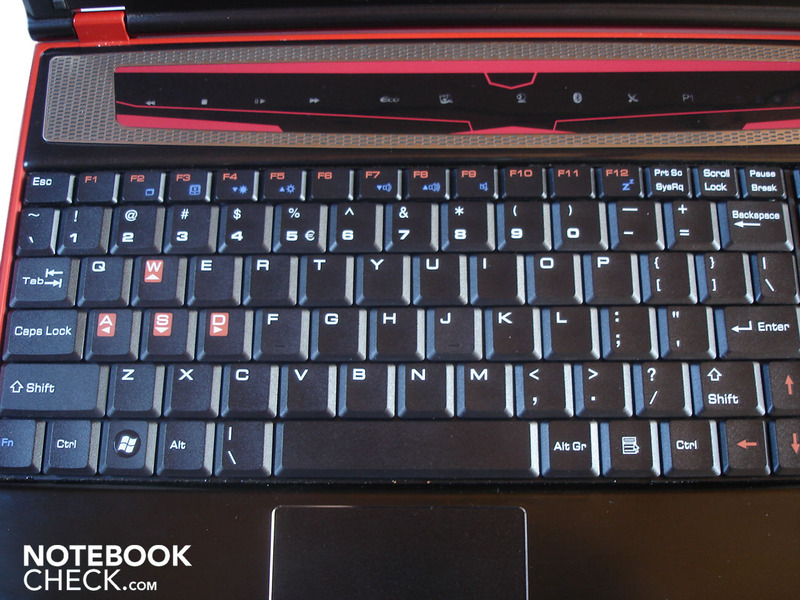 Basically, we can only recommend attaching an external keyboard right away for office tasks and even gaming. Even cheap 10 euro keyboards have a far better typing feel. A touch-sensitive bar is found above the keyboard. It has (in opposition to the keyboard) an excellent and delay-free trigger response. 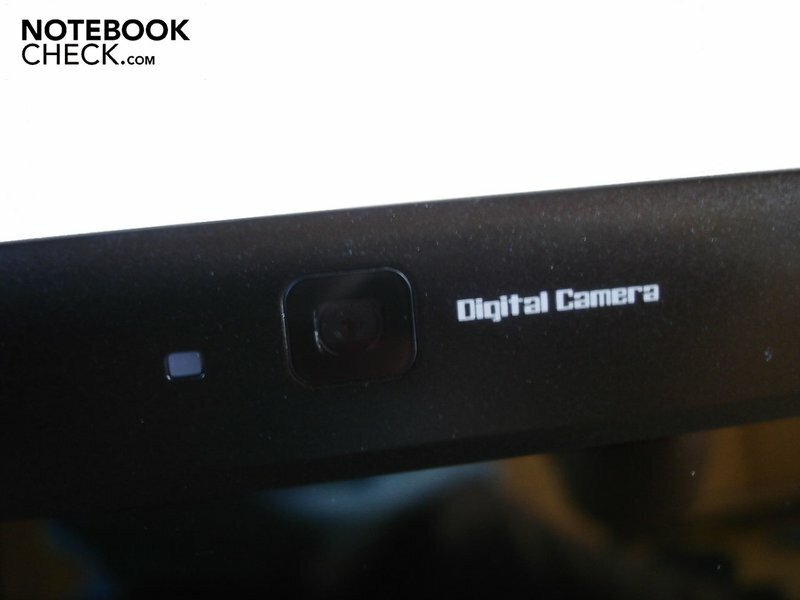 The bar includes a little multimedia control (rewind, stop, pause/play, fast forward), the mentioned Eco and Cinema Pro functions and buttons for enabling and disabling webcam, Bluetooth, WLAN and a user-defined program. 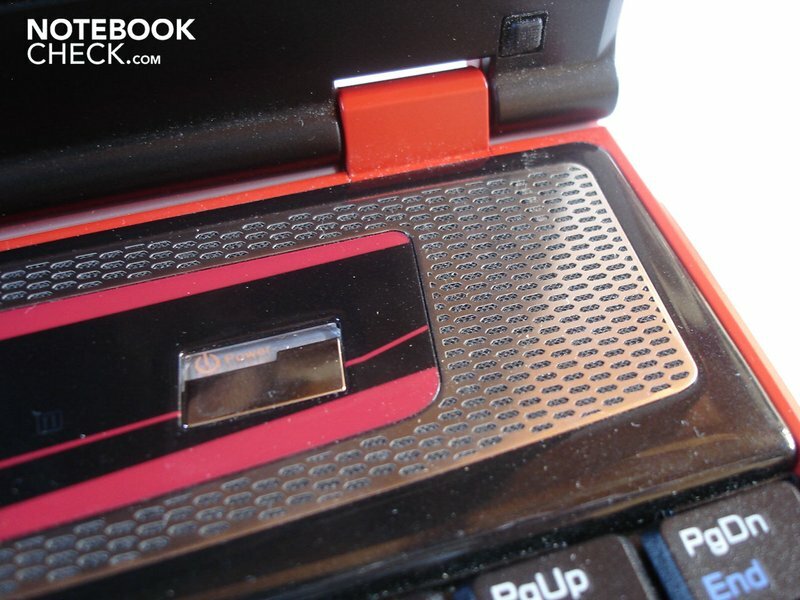 The touchpad that is slightly submerged and trimmed with a silver frame is sufficiently sized. 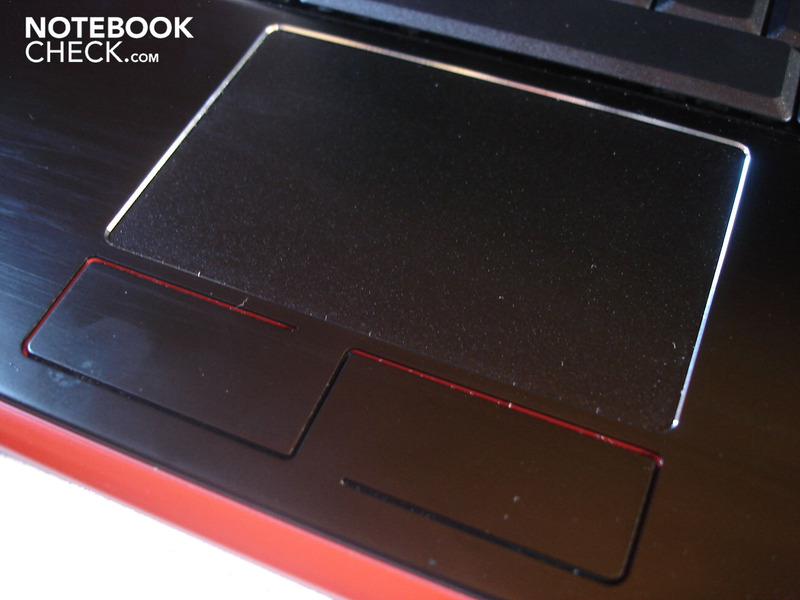 The touchpad is convincing due to the fairly smooth surface with good gliding traits. The scroll bar works perfectly, except for a few rare interruptions. Finally, the key pressure of both mouse keys milled into the wrist rest surface is good even if not overwhelming. However, due to the design, dirt accumulates quickly between the keys (crumbs, dust) and can only be removed with difficulty. Opposing the general trend of wide screen displays in a 16:9 format, MSI stays loyal to the "old" 16:10 format. Thus, the GT640's 15.4 inch screen has a resolution of 1680 x 105 pixels. The display's values are quite fluctuating. Whilst the black value of 0.30 cd/m2 is very good, the luminosity with an average of 150.8 cd/m2 is on a disappointing level. In return, the high contrast of 605:1 is over-average. The illumination of 74% proves to be just still good. The saturated black, the intense colors and the contrast-rich presentation pleased us, subjectively. The image remained to generally be a bit pallid because of the low brightness (constant in battery mode). 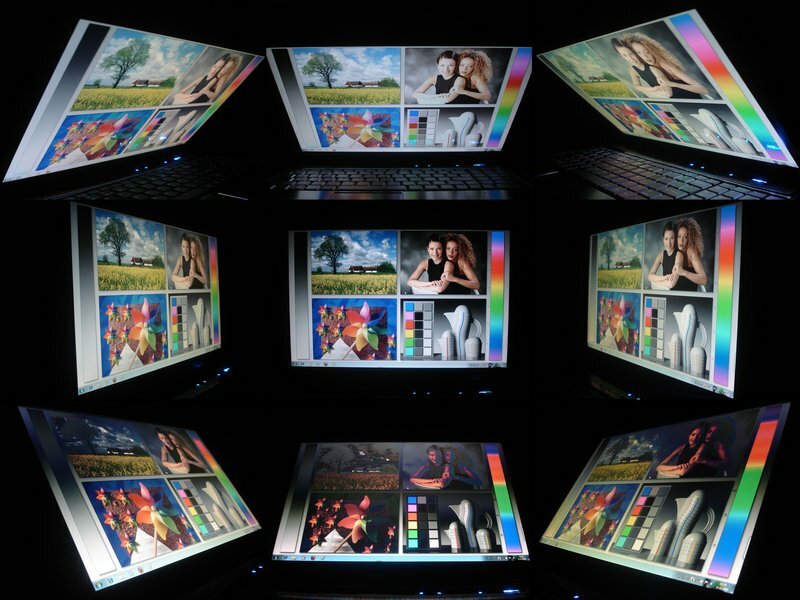 MSI, however, doesn't oppose the (negative) trend when it comes to the reflective display. It can already come to annoying reflections in bright interiors and across from windows, which can get eminently disturbing at movie rendering. An outdoor use is almost impossible in stronger sunlight in the end. The viewing angle stability on the horizontal plane is adequate. In opposition, color deviations and brightness differences turn up quicker on the vertical plane, making a frequent adjustment necessary. Intel now really can't complain about not enough sales lately because almost every manufacturer puts the mobile Core i7 in their gaming and multimedia notebooks over 100 euro. MSI has selected the starter model, i7-720QM, which represents one of the currently fastest CPUs in any case. 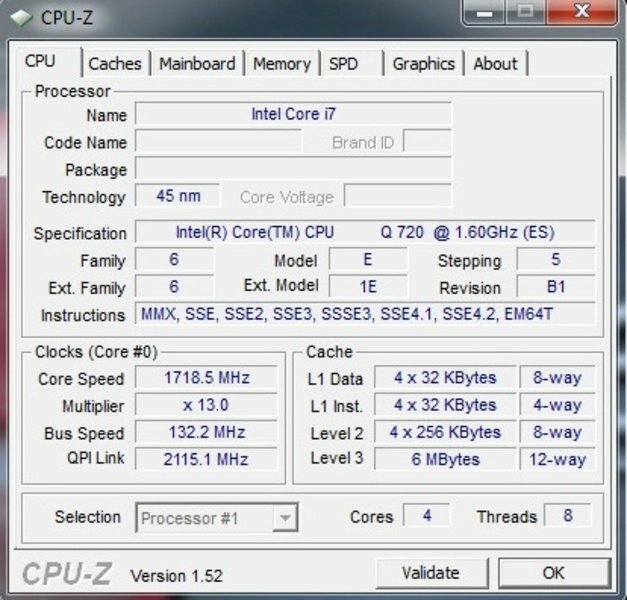 This four core processor clocks with a (meager) 1.60 GHz in idle mode. The clock rate is boosted automatically up to 2.8 GHz under load with support from the so-called "Turbo Boost" technology. A further feature is the "Hyper Threading" Technology that simulates four cores in addition to the four real cores of the i7-720QM. The impact of Hyper Threading in games is rather limited, but in optimized applications a notable velocity increase can be achieved, though. In opposition to the "old" Core 2 architecture, the Core i7 doesn't only have an L2 but also an L3 cache. This adds up to one MByte (L2) and six MByte (L3) in the i7-720QM. 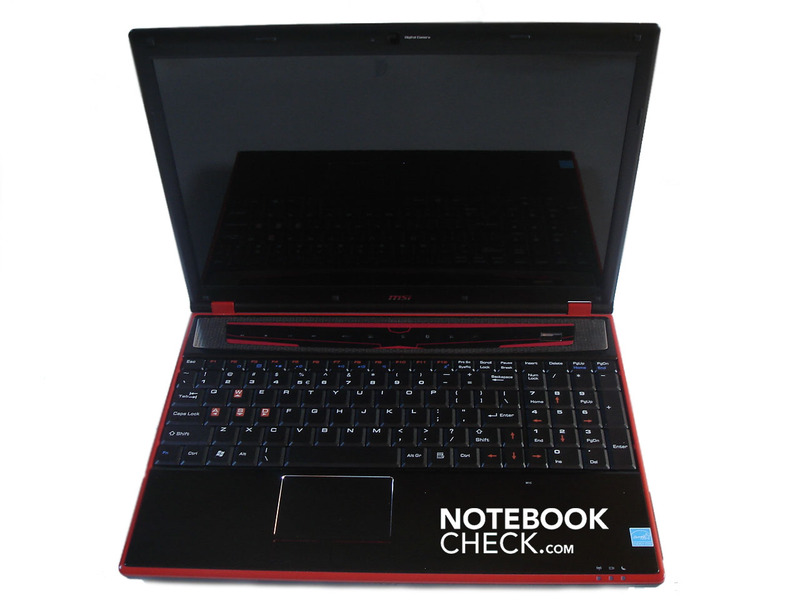 The i7-720QM's maximum energy requirement is however a high 45 watt, which is why the Core i7 isn't exactly suitable for notebooks made for mobility. 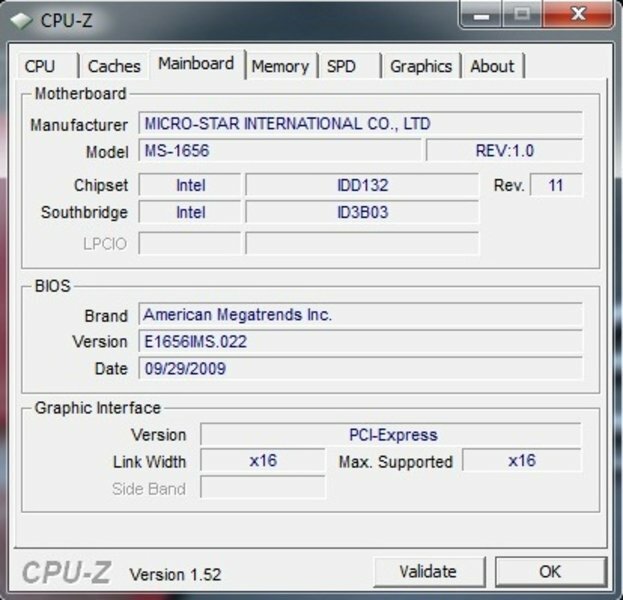 The Core i7 is supported by a four GByte DDR3 RAM with 1066 MHz. 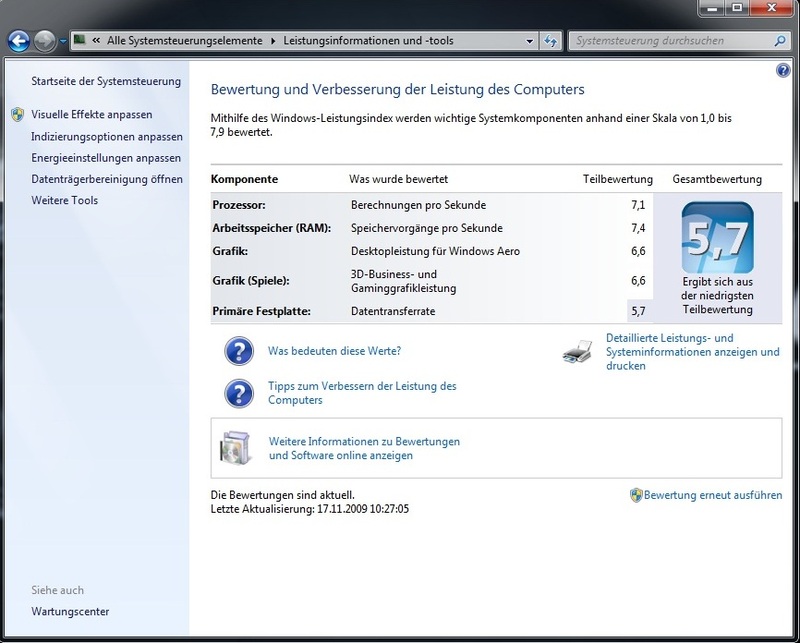 For some unknown reason, MSI has taken the 32 bit alternative of Windows 7 Home Premium, though. Thus, there are only around 3 GBytes available in practice and a lot of potential is wasted unnecessarily. MSI uses Nvidia's brand new graphic card, the GeForce GTS 250M. In opposition to high-end GPUs, such as the GeForce GTX 280M/GTX 260M, the GeForce GTS 250 M is (finally) related to the current desktop architecture GTX 200. 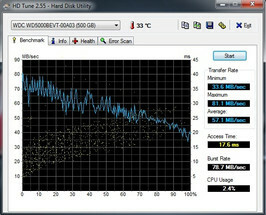 The GT215 core is the basis for it. The GeForce GTS 250M is also one of the first mobile cards from Nvidia that supports DirectX 10.1. Furthermore, the GeForce GTS 250M, manufactured with the state-of-the-art 40nm structure width, has 96 stream processors, a moderate power consumption of 28 watt, supports PhysX and has an opulent memory size of 1024 Mbyte. However, the memory bandwidth of only 128 bits is a bit disappointing. Either a fast GDDR5 or GDDR3 module is employed as video memory. The GDDR5 VRAM reaches a maximum rate of up to 500 MHz (core), 1600 MHz (memory) and 1250 MHz (shader). 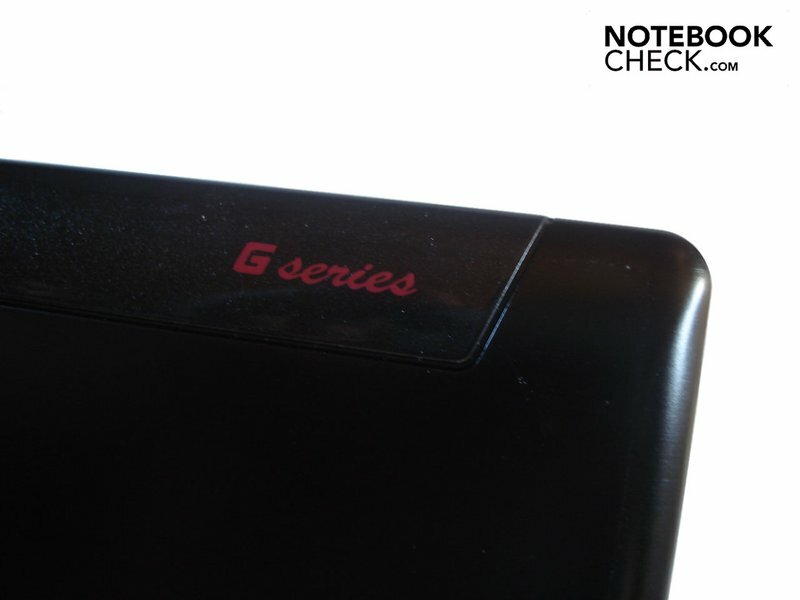 However, the GTS 250M, equipped with a GDDR3, only clocks with 450MHz (core), 790 MHz (memory) and 1080 MHz (shader). Finally, the GeForce GTS 250M also supports the CPU at computing high resolution video material thanks to "Pure Video HD" Technology. The Core i7-720QM looks great in the processor-biased Cinebench R10. 2995 points in single-core and 7796 points in multi-core rendering are more than impressive. 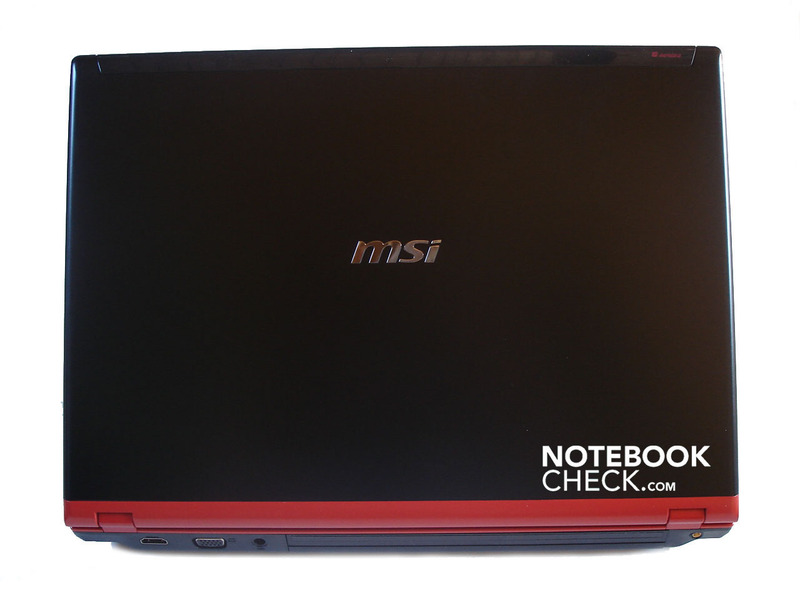 The multi-core rate could have turned out considerably higher if MSI had used the 64 bit operating system. 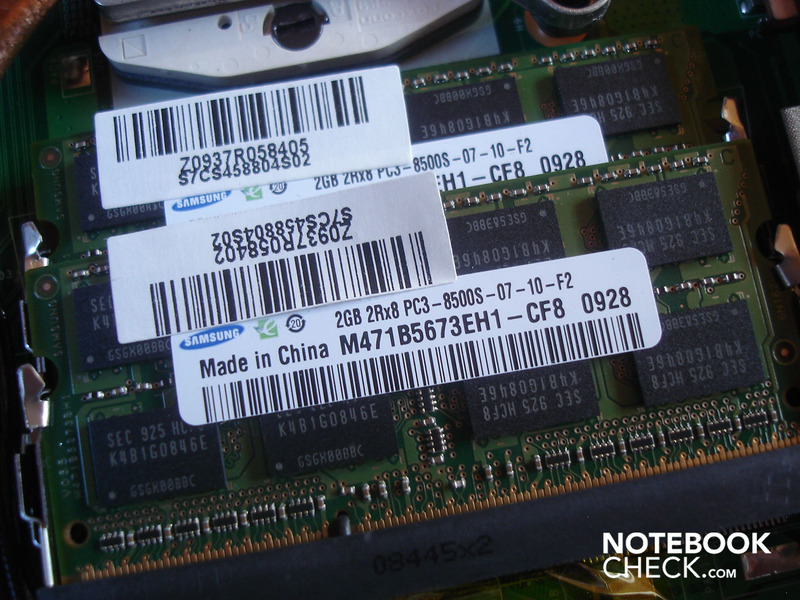 Other notebooks with a Core i7-720QM achieve over 10000 points here. 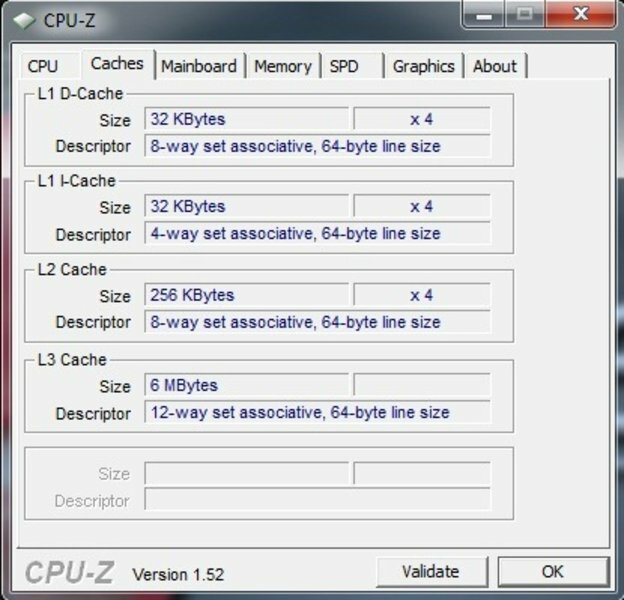 In comparison: The Core 2 Quad Q9000 (2.00 GHz, 6 MByte L2 cache), favored by manufacturers, computes in single-core rendering a bit slower with 2386 points, but in multi-core rendering a bit faster with 8267 points. 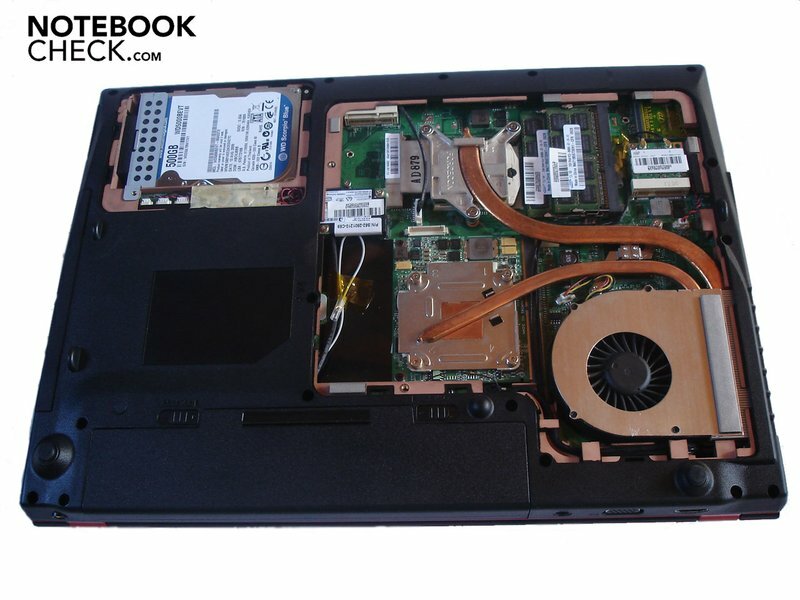 The Core i7-720QM could achieve an impressive 3453 points in the PCMark Vantage. In order to really exhaust the graphic card, we used various versions of 3DMark. 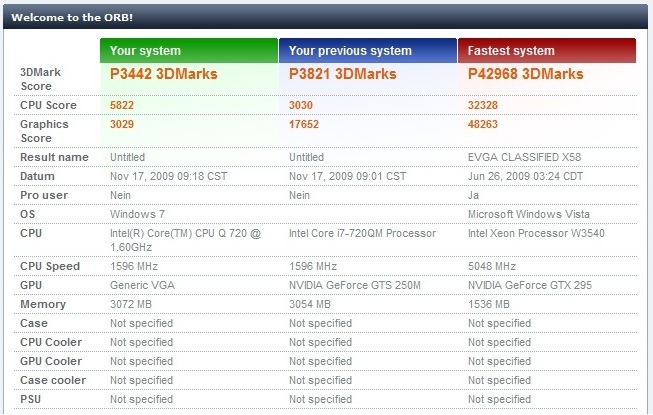 The GeForce GTS 250M achieved a good result in 3DMark05 with 14463 points, just like with 7433 points in 3DMark06. As expected, the rate fell under the 5000 mark in 3DMark Vantage and was a good 3442 points. In comparison: A Radeon HD 4670 (e.g. 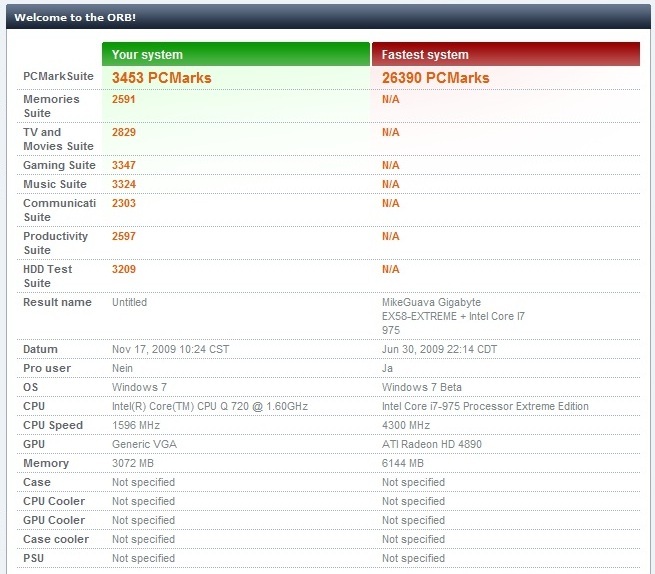 in MSI's GX623) is a bit slower in 3DMark Vantage with around 3000 points, a GeForce GTS 160M (e.g. in MSI's GT628) is a bit faster with almost 4000 points, whereas a Radeon HD 4850 (e.g. 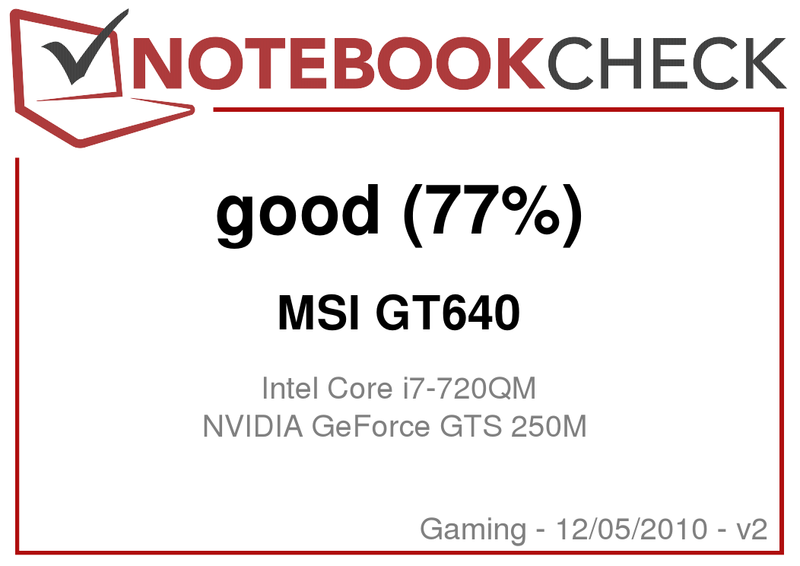 in MSI's GT725) takes a good lead with over 5000 points. 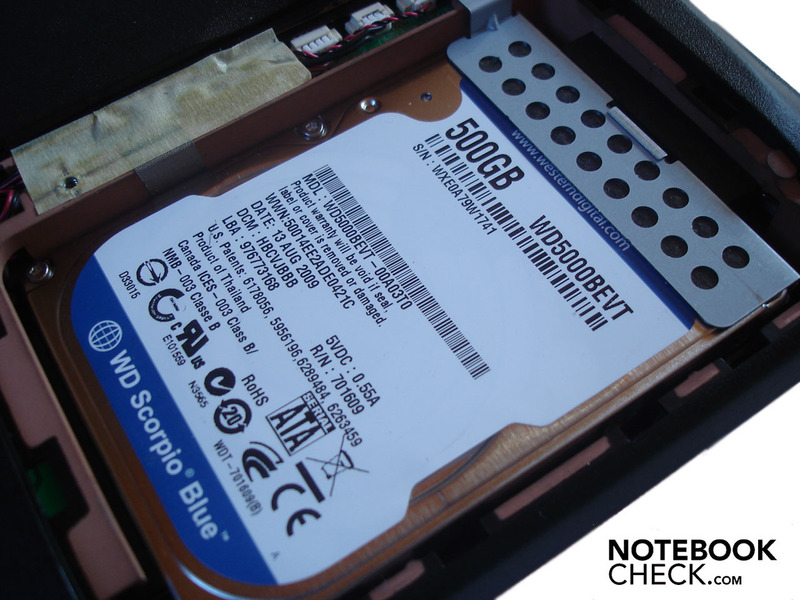 The GT640's hard disk is from Western Digital's fast Scorpio Blue range and has a gross capacity of 500 GBytes. We established the hard disk's rates with HDTune. The throughput rate was good with 78.7 MB/s, the access rate of 17.6 ms could be better and the transfer rate with an average of 57.1 MB/s is good. 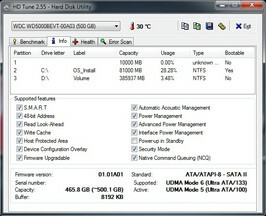 MSI has divided the hard disk into two partitions. Whilst the OS partition has about 80 GBytes, the second partition has a capacity of 376 GBytes. The Window 7 performance index theoretically gives a brief overview of the approximate efficiency of a system and possible bottlenecks. The index isn't very significant in practical use but we will mention its achieved values here anyway. The processor, as well as the RAM scored very good results with 7.1 respectively 7.4. 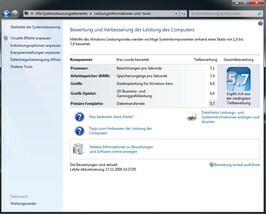 The graphic card with 6.6 lagged slightly and the hard disk lagged notably with 5.7. Users who want to use external devices, like sound cards, with the GT640 don't have to worry in consideration of latencies. 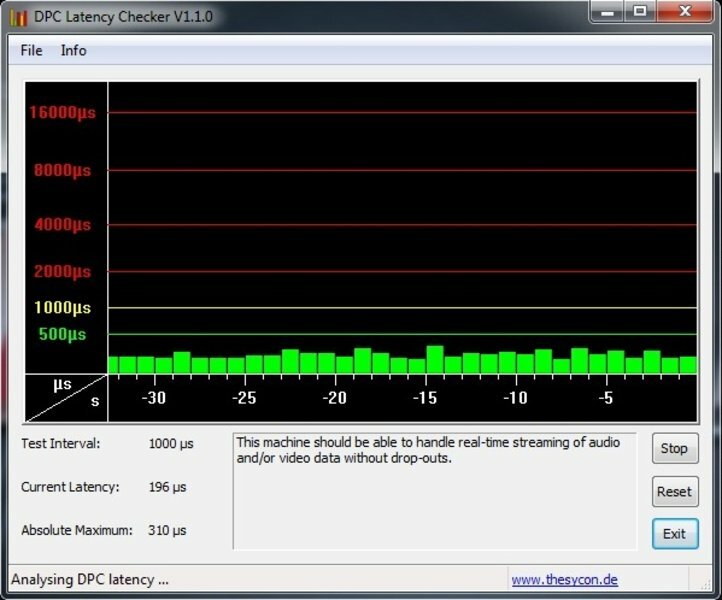 According to the DPC Latency Checker tool, they always stayed in a field under 1000µs, whereby a rate of 300µs was barely surpassed. The application performance is more than only "good" due to Core i7-720QM and GeForce GT250M. Especially the processor remains unperturbed even with the most demanding applications and always supplied a high performance. However, it becomes evident that the GeForce GTS 250M has a disadvantage in comparison to the processor and, in particular, to other graphic cards. We'll will now examine if this trend is also continues in gaming with the gaming benchmarks. 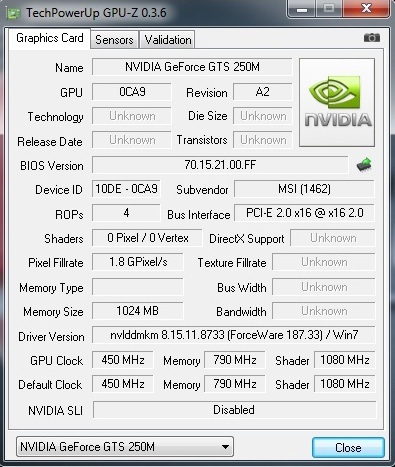 One thing first: The GeForce GTS 250M's velocity breaks-in disproportionally when image enhancements are enabled. Therefore, users should generally waiver on antialiasing and anisotropic filters in demanding games. The GT640 unveiled a problem right away in the showcase-shooter Crysis. The reason: The performance fluctuated enormously from runthrough to runthrough. Thus, the average refresh rate with medium details (1024 x 768) was between 34.8 and 49.5 fps in the CPU, and between 30.8 and 51.8 fps in the GPU benchmark. The difference at high details (1024 x 768) turned out far less with between 21.3 and 25.1 fps in the CPU, and between 23.8 and 28.1 fps in the GPU benchmark. 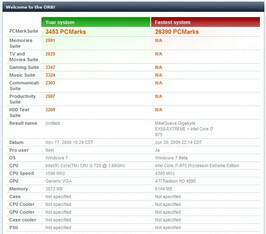 The recently reviewed Acer Aspire 8940G, equipped with the same CPU and GPU, displayed a similar behavior. In opposition to Modern Warfare 2, Need for Speed Shift isn't exactly merciful with the resources. Thus, Shift jolts along with an unplayable 20.4 fps in its native resolution, high details and 4 x AA. If the detail level is set to medium and the AA is reduced to a two-fold value, Shift runs notably faster with 27.1 fps but still isn't fast enough to steer precisely around the race tracks. The refresh rate jumps up to a smooth 37.1 fps in its native resolution when medium details are retained and AA is disabled. Anno 1404 is probably the prettiest building strategy game at the moment and enthralls gamers regardless of their age. But the enthusiasm ebbs quickly at a resolution of 1280 x 1024, very high details and 4 x AF with a mediocre 26.2 fps. The Radeon HD 4670 is slower with 22 fps, the GeForce GTS 160M (34 fps) and Radeon HD 4850 (42 fps) are partly obviously faster. In return, a resolution of 1680 x 1050, high details and 2 x AF run reasonably on the GT640 with 30.7 fps so that nothing stands in the way of entertaining building fun. The GT640 doesn't have any problems with Valve's lively zombie shooter. 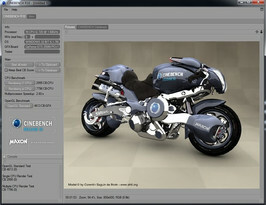 A resolution of 1024 x 768 and very high details result in a smooth as silk 66.5 fps. The native resolution, very high details and 4 x AA also still run smoothly with 41.6 fps. 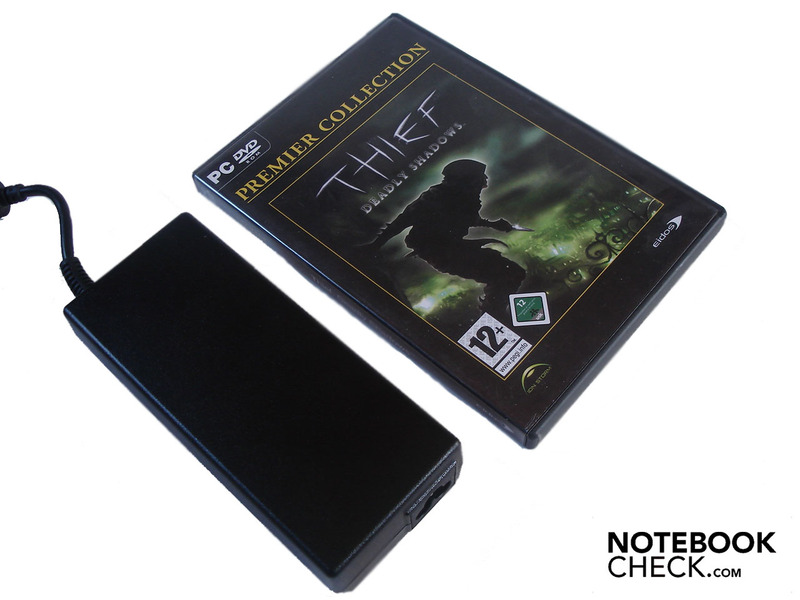 The GT640 struggles massively with the enigmatic Gothic successor. The notebook doesn't exactly compute very fast even in medium details, 2 x AF and a low resolution of 1024 x 768 with 31.4 fps. The performance even breaks down to 18.6 fps at a resolution of 1680 x 1050, high details and 4 x AF. It doesn't look much better with medium details and 2 x AF with 20.8 fps in the native resolution. First a complete disabling of the anisotropic filter in medium details (1680 x 1050) leads to a halfway playable refresh rate of 26.7 fps. The GeForce GTS 250M gets along a lot better with F.E.A.R. 2. There isn't anything speaking against a cultivated opponent chase with 41.2 fps at a resolution of 1280 x 1024 and high details with 4 x AA. The GeForce GTS 160M is at about the same level with 42 fps. The Radeon HD 4670, with 52 fps, proves to be slightly faster, the Radeon HD 4850 a lot faster with 86 fps. High details, 4 x AF and the native resolution are then, however, too much for the GeForce GTS 250M and F.E.A.R. 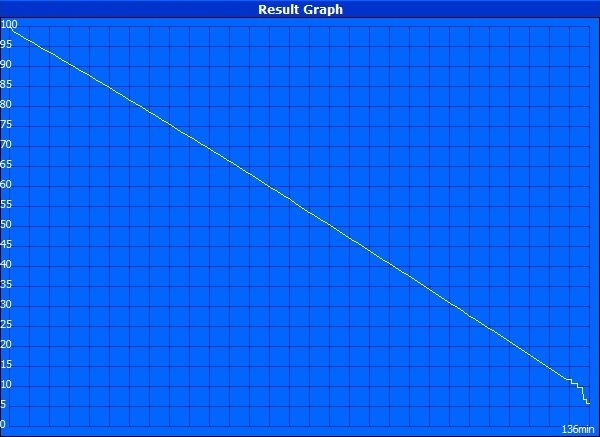 2 jolts along disagreeably with 28.0 fps. A decrease to medium details and 2 x AA barely has an impact with 31.2 fps. Primarily, a complete disabling of antialiasing leads to a well playable 39.4 fps in medium details (1680 x 1050). Waivering on antialiasing or anisotropic filters can lead to an enormous performance increase, as can be seen in games like Modern Warfare 2, Shift, Risen or F.E.A.R. 2 The GTS250M's given performance is good without image enhancements but by far not overwhelming. Many games can very well be played in high details with the native resolution of 1680 x 1050, but you won't be able to avoid medium details in a few tracks. This way Intel's Core i7 can't really develop its potential because the graphic card is the proverbial bottleneck. Thus, the component constellation can't really be called balanced. 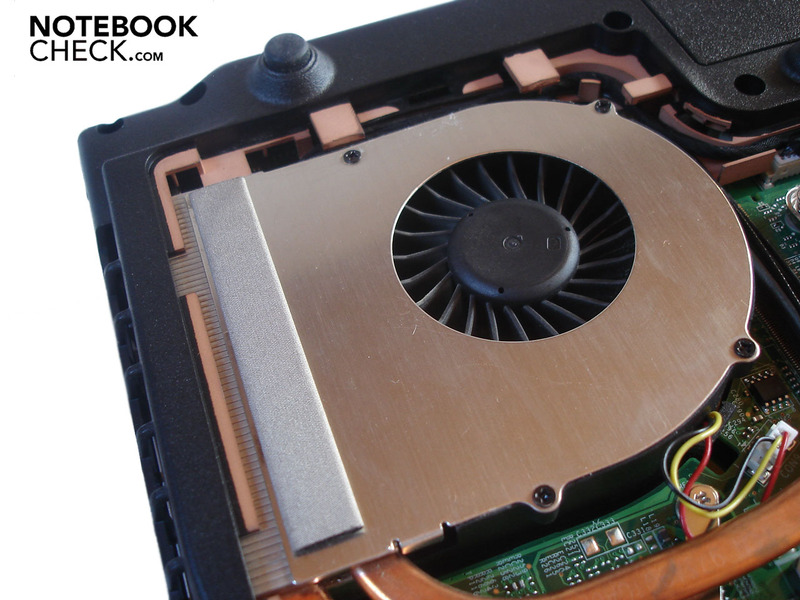 Generally, the GeForce GTS 250M's performance is only marginally over that of the Radeon HD 4670, which is used in far lower-priced notebooks, such as the mentioned MSI GX623. Other graphic cards, positioned in a similar price class as the GT640, show a far better gaming performance despite a weaker CPU. 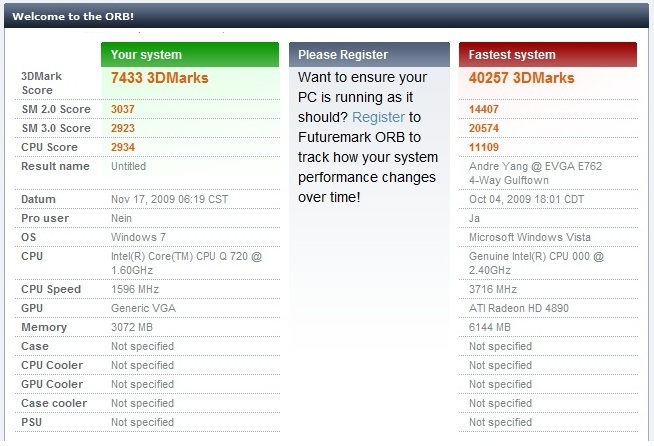 Thus, the older model, MSI GT628, with a GeForce GTS 160M, as well as the MSI GT725 with a Radeon HD 4850 are both faster. 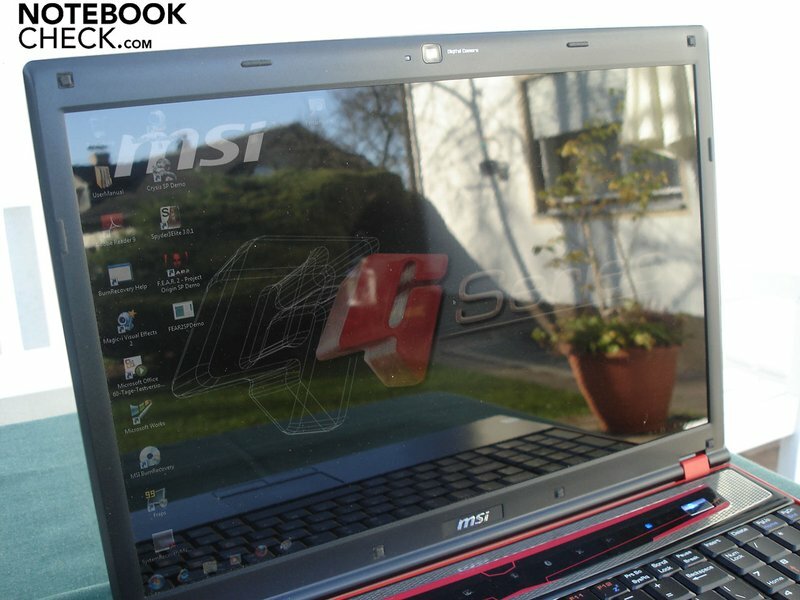 MSI's gaming notebooks aren't exactly known for a low soundscape and the GT640 isn't an exception. 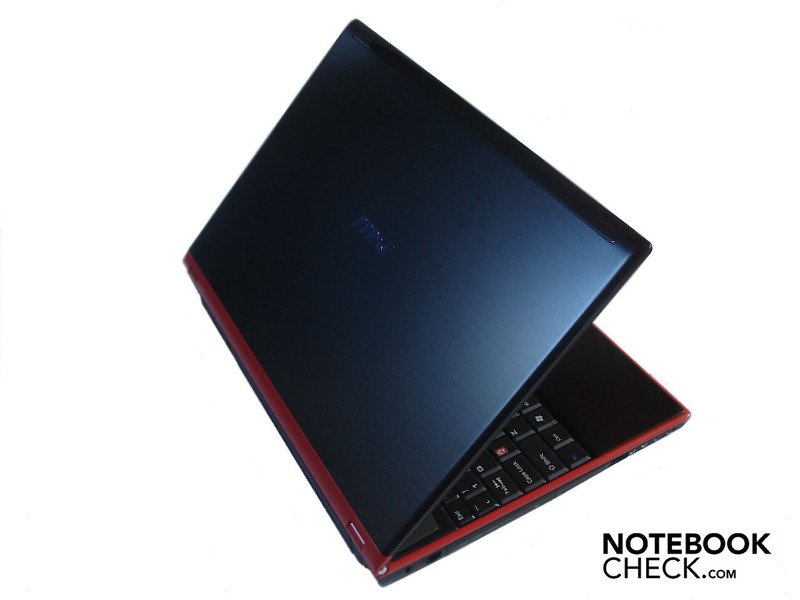 The notebook already audibly attracts attention in idle mode with 35.1 up to 38.5 dB(A). The fan even turns up to a very audible 43.2 dB(A) up to a disturbing 49.1 dB(A) under load. Noise sensitive users should, therefore, keep away from the GT640. The surface temperature stays within an acceptable field in idle mode (two hours operating, maximum energy savings options). The upper side heats up to 30.6°C, whereas the bottom reaches a maximum of 38.4°C. The case works up a sweat under full load (one hour Furmark & Prime). The wrist rests on the upper side heats up to a slightly uncomfortable 37.2°C. The bottom heats up enormously in the fan area with a maximum of 54.7°C, which is why the GT640 shouldn't really be placed on the lap. At least the graphic card is tempered reasonably among the components. 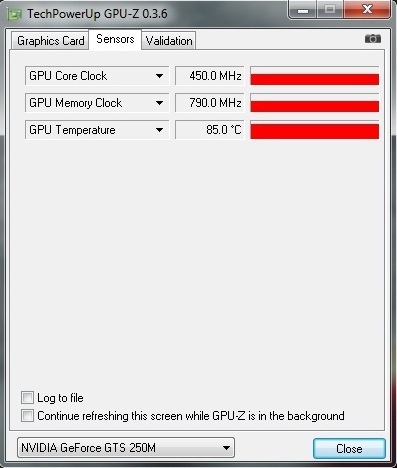 Whilst the GeForce GTS 250M reaches 47°C in idle mode, it's a high but still acceptable 85°C under full load. 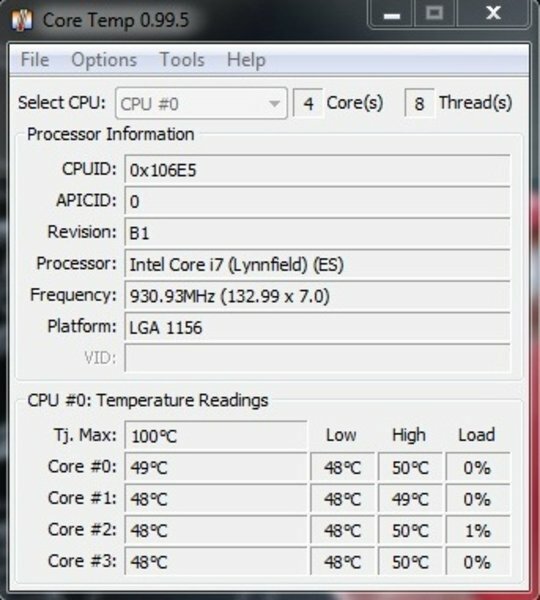 The CPU's temperature is okay with 50°C in idle mode. 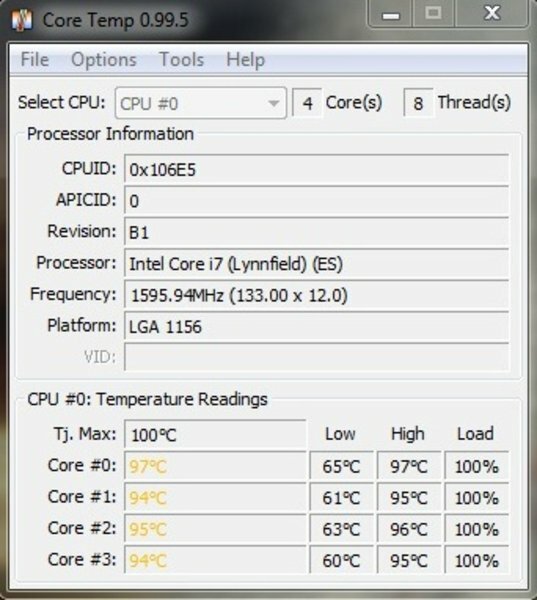 The Core i7-720QM heats up to an alarming 97°C under full load. 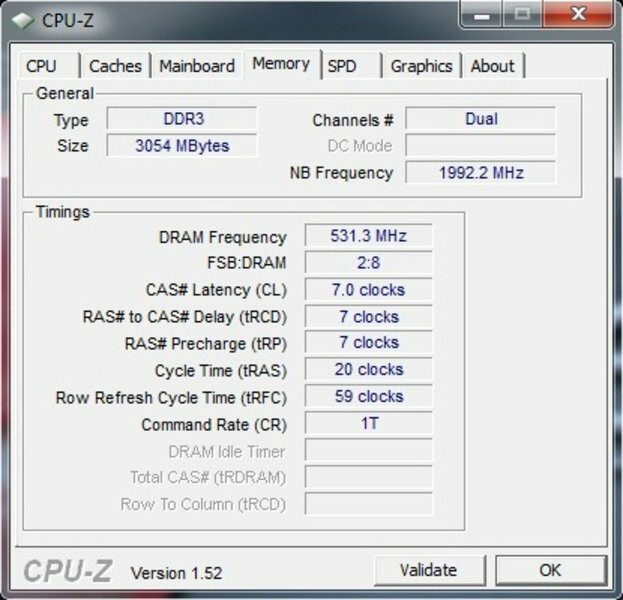 Problem: The CPU clocks itself down to 931 MHz after longer full load for a about 15 minutes. Interested readers shouldn't worry too much as situations with a longer load of 100% doesn't turn up in a normal gaming day. In any case, the CPU wasn't throttled in our gaming tests of several hours. (+) The maximum temperature on the upper side is 37.2 °C / 99 F, compared to the average of 39.3 °C / 103 F, ranging from 21.6 to 68.8 °C for the class Gaming. (-) The average temperature of the palmrest area of similar devices was 28.7 °C / 83.7 F (-8.5 °C / -15.3 F). Both built-in loudspeakers were completely disappointing. Starting with the bass that is present, but very indistinct and faint. Further over the trebles that tend to fray fast and are quite imprecise, up to a generally tinny sound. The soundscape is just still okay at gaming but an external sound system should be connected in any case at music or movie rendering. By the way, we couldn't establish a subjective change or improvement in sound neither in games nor in music or movies when we enabled the mentioned Cinema Pro mode. 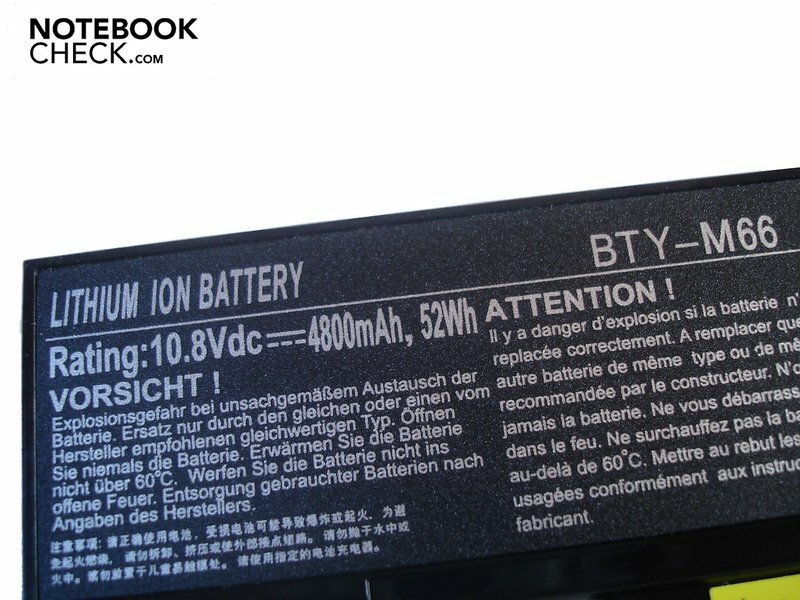 The six cell battery with 52 Wh isn't able to satisfy the energy requirement of the Core i7-720QM and the GeForce GTS 250M over a longer period. 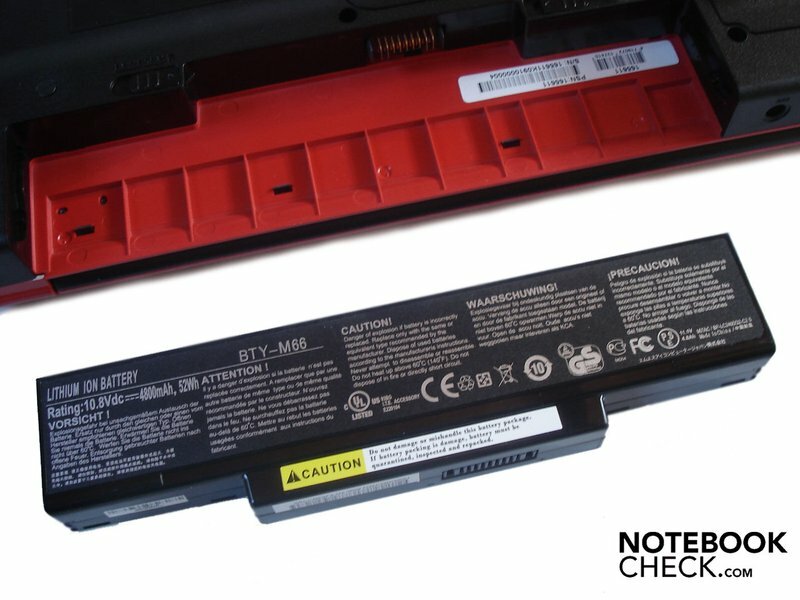 The notebook was already thirsty after about one hour in BatteryEater's Classic test at maximum brightness, disabled energy savings options and load. It doesn't look much better at DVD rendering with maximum brightness and medium energy savings options with 1 hour and 19 minutes. The GT640 couldn't even surpass the two hour mark at internet surfing via the integrated WLAN with 1 hour and 50 minutes. 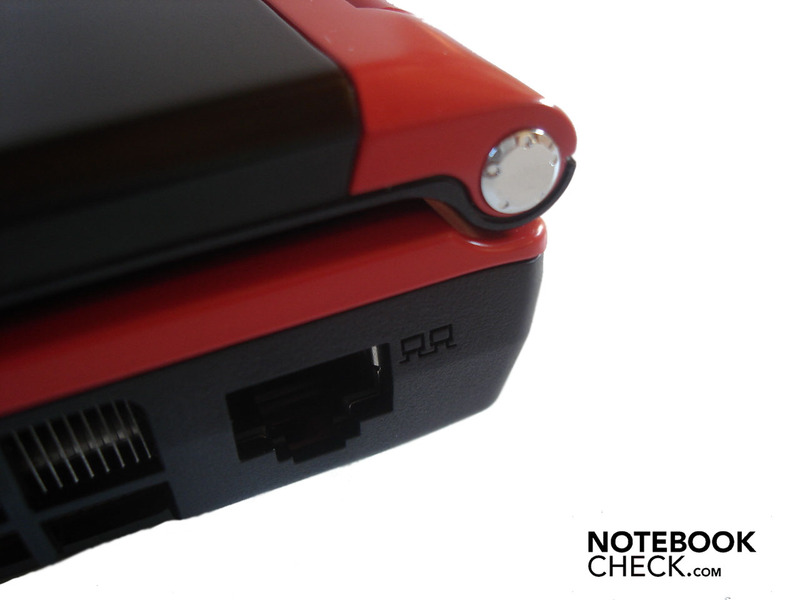 The notebook first pulls itself to a runtime over two hours at minimum brightness, maximum energy saving mechanisms and low load with 2 hours and 16 minutes in the BatteryEater Reader's test. Thus, the GT640 isn't suitable as a wireless gaming platform; there should always be a socket at hand, if possible. A, for notebook measures, moderate 23.6-32.0 watts are reached in idle mode. The energy requirements increases to an acceptable 79.8-97.5 watts under load. 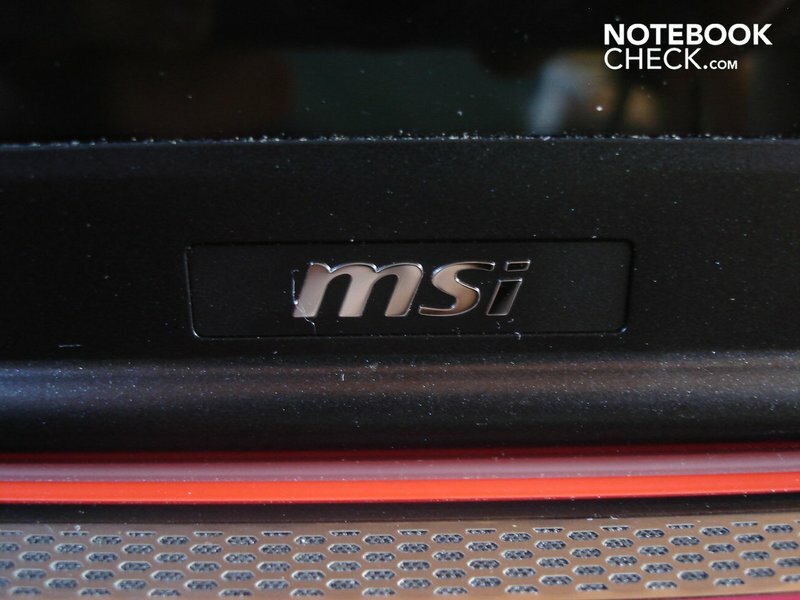 The MSI GT640 has a few flagrant weaknesses. Thus, especially the recoiling keyboard with its indistinct pressure point and bizarre layout is more than a disaster. In addition, both the battery life and the given sound always remain scanty. The display also shows itself as lacking a bit of luminosity and is annoying with its intense reflections. Further disappointments are the (too) high soundscape and the, in comparison to the strong Core i7-720QM, average performance of the GeForce GTS 250M. However, the GT640 also has positive sides. Especially the compact case with its matt surfaces made of high-end brushed aluminum is impressive. 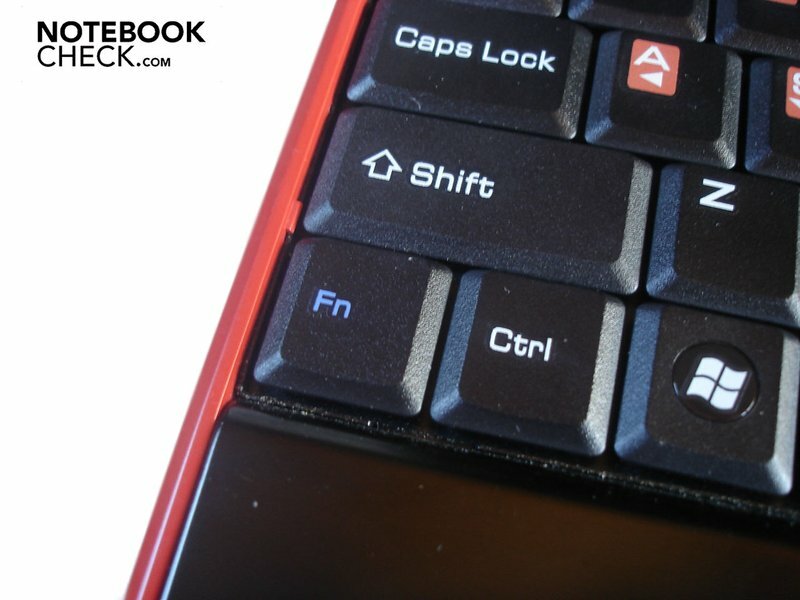 Furthermore, we liked the smooth and precise touchpad with its chic keys. Also, the interface variety has turned out quite generous. If you're looking for a notebook with high processor performance and aren't deterred by a poor keyboard and a high soundscape, you can definitely take the GT640. But if you're looking for a gaming notebook with the highest possible efficiency, you should rather take a product with a more efficient graphic card (e.g. GeForce GTS 160M & GeForce GTX 260M). 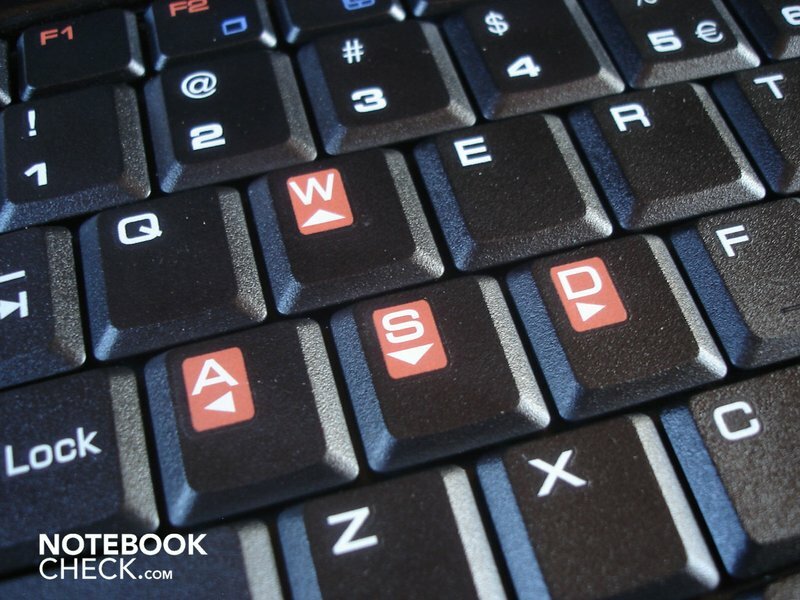 What did MSI have in mind when it put the Fn key left of the Crtl key? 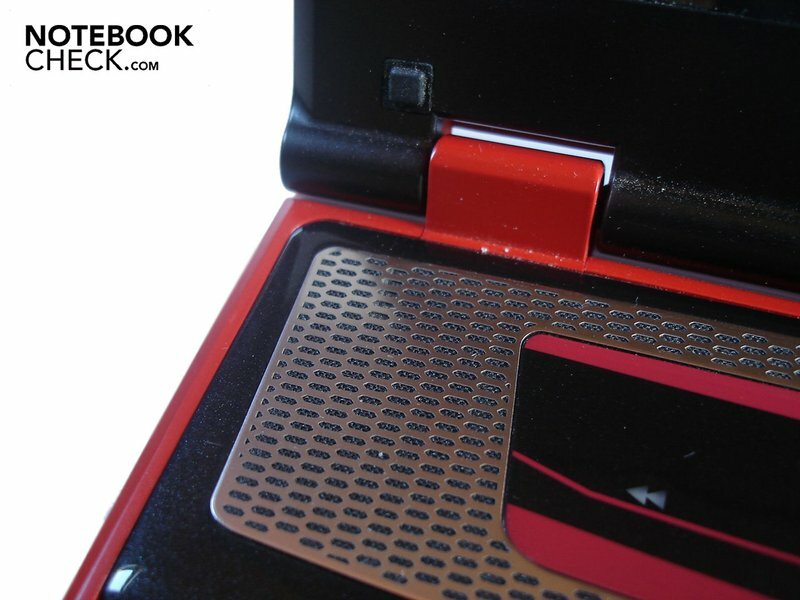 The chic and compact case with its matt surfaces and the high-end materials (aluminum). Also the circumferential connectivity. A somewhat more luminous display and a keyboard with a better pressure point, which also doesn't yield as much and has a user-friendlier layout. The GeForce GTS 250M (DDR3 VRAM) usually doesn't have enough power for the native resolution of 1680 x 1050 pixels in high details and enabled image enhancements. 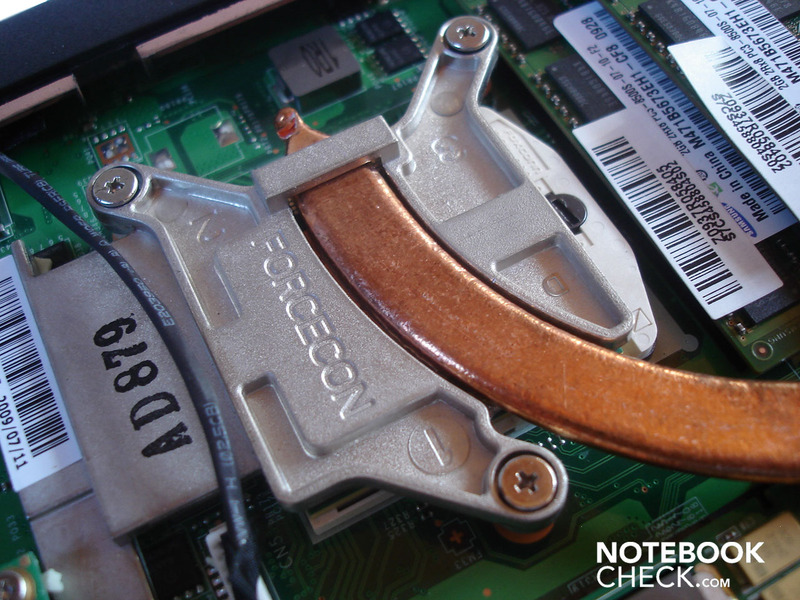 Efficient gaming notebooks. With a GeForce GTS 160M, such as MSI's GT628. Or with a GeForce GTX 260M, like Alienware's M15x, Asus' G60J, Asus' G60VX, Asus' G71GX, Asus' G72GX and mySN's XMG5 (Clevo M860TU). Or with a GTX 280M (SLI) as in Cybersystem's QX18 (Clevo M980NU), Deviltech's Devil 9700 DTX (Clevo 860CU) and mySN's XMG7.c (Clevo W870CU). 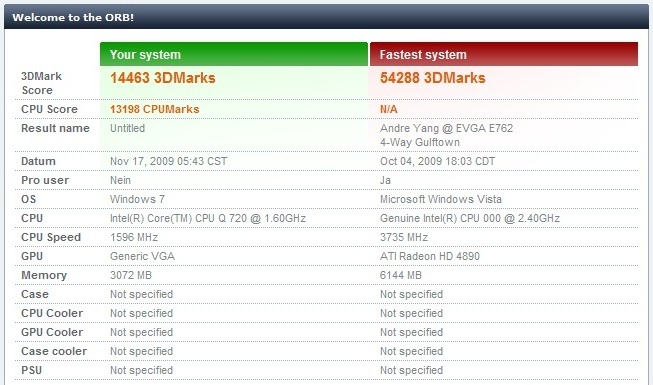 Or with a Radeon HD 4850 as in MSI's GT725.